The idea that cricket offers both an insight into the English psyche and a template for its reproduction among other cultures appears to have gained the attentions of Adolf Hitler. According to John Simpson, the BBC’s World Affairs editor, Hitler was taught the rudiments of the game by British PoWs. In his new book, Unreliable Sources: How the 20th Century was Reported, Simpson writes of an article in the Daily Mirror from 1930 written by Oliver Locker-Lampson, an MP sympathetic to the Nazis. Locker-Lampson quotes British veterans of the First World War who played cricket in captivity near the hospital where the then Corporal Hitler was recovering from wounds and asked them to explain their antics. Though intrigued by the game, Hitler concluded that it was ‘insufficiently violent’. Had he witnessed the Bodyline series between England and Australia which began in 1932, he may have revised his opinions. Such was the ferocity of the bowling of England’s Harold Larwood, it caused a diplomatic row between the mother country and her antipodean dominion. 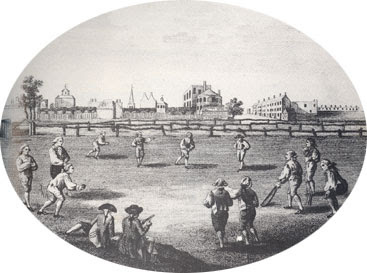 In Carry on Cricket - The Duke of Dorset's 1789 Tour John Goulstone and Michael Swanton remember how, in the summer of 1789, the English cricket team set out on a visit to Paris. However, the proposed cricket tour never took place. It certainly is! In the 1990s I was involved in 'TEATIME' - teaching English abroad to integrate middle Europe! I went to live & work in Hungary, running an exchange programme between Devon County Council & Baranya County General Assembly. With the help of the University of Pecs Education Department, a Devon's Cricket Coach came to Hungary & introduced 'Quick Cricket' into the schools. Played indoors, due to the lack of level playing grounds or even golf courses, within a week it really took off, to everyone's amazement, and the final competition between the schools was fiercely contested! Interesting fact that,cricket offers both an insight into the English psyche,also the post is amazing too.